People who work in certain jobs should be vaccinated against diseases they may be exposed to at work. Monument Occupational Medicine can provide workplace vaccination assessments for your employees at at-risk staff. Vaccination clinics (full-day) may be delivered on-site or alternatively, your employees can visit our office for individual vaccinations. 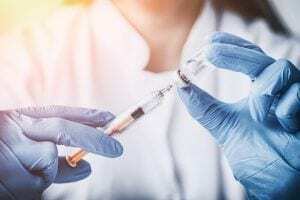 If you would like to schedule an onsite vaccination clinic or an in-clinic vaccination appointment, contact Monument Occupational Medicine today and we can help.